Rest of script is of Ravinder Singh. I hate ‘Dullards’ and am shocked at some of the MOST WEIRD provisions in the Budget 2016-17. Most Crucial to Indian Economy is for Indian Industry to SERVE WORLD MARKET. R&D investment alone required $40b/Yr or 2% of GDP to just make a start. Startup Program is basically SME workshop or trading or Dhaba kind of business. Farmers get just Rs.2,00,000 Cr Long Term Credit plus 6,50,000 Cr which is recycled 1.3 Times – Roughly Rs.12,00,000 Cr Transaction Value. LPG Connection to 5 Cr BPL Rural Consumers – Rs.1,300 Subsidy Per Consumer But Consumers need KITCHENS – Gas Stoves don’t work in Open to Air Kitchens. Subsidized Cylinders May be running Cars of Rich. House RENT Tax Deduction of Rs.60,000 is Directed at SELF EMPLOYED Only WHO MAY BE PAYING Rs.100 PM Rent for Shop & Rs.250 PM For Homes. HOUSE TAX CHARGED IS TWICE FOR RENTED PROPERTY – NO TAX DEDUCTIONS TO OWNERS WHO INVEST IN HOUSING!!!! None of Corporate had been JAILED who had taken Rs.50,00,000 Crores Loans, Deposits, Rs.100,00,000 Crore Stock Market Cap – $600b Foreign Investments & $900b FDI. Rajat Gupta was prosecuted for Stock Market Manipulation & Insider Trading by Public Prosecutors not by Tax Tribunals. No Corporate Jailed for FRAUDS in India. Mukesh Ambani Operates 104 Subsidiaries Fraudulently. 95% Growth Will Come From Corporate & Existing Investments – STICK was required to Ensure Efficiency & Productivity, Tax Contribution, Job Creations, Recovery of Loans. Rs.10,00,000 Cr to Rs.20,00,000 Cr LOANS Recovered Could Have Been Re-Invested in Startups, Farm SMEs, Jobs & Wealth Creation. When Gujarat alone plans to Spend Rs.10,000 Cr Plus on Irrigation contributing just 4% to Foodgrains Production – Rs.17,000 Cr Irrigation Budget for India meanz nothing for India. This too shall be Limited to BJP States which have hundreds of pending projects. But Most WEIRD is 5,00,000 Farm Ponds – Allocation of Rs.6,000 Cr for Ground Water Recharge. Even if Farm Pond Land Area is 1 Hectare – Land Value Could Be Rs.1 Cr – So Land Worth Rs.5,00,000 Cr Could Go Under Ponds for Rs.6000 Cr Subsidy. Farmers Don’t Need Soil Card – Must Apply Nutrients Required for Crops. Satellite Imaging is Quick and Inexpensive to Pin Point Nutrient Deficiencies. Do We Need Local Production of Foods or National Market? Obviously Local Production – FARMERS REACH IS WITHIN 50 KM – E-Market shall benefit Corporate TRADERS. Storages were required at Point of Production – At Farm and Freezers at Consumers Homes – GoI is promoting Exploitation of Farmers & Consumers. Oscars 2016 were announced today at Los Angeles with all glitz and paparazzi. Here’s the complete list of the winners of this year’s Oscars. ‎BUDGET2016‬ LACKS BOTH VISION & CONVICTION. Mahatma Gandhi National Rural Employment Guarantee Scheme has been allocated Rs. 38,500 crore ahead of important elections in five states this year. Modi ji spent the first 2 years mocking the Congress Party’s focus on farmers, MNREGA, Rural dev & social spending. Now mere rhetoric, without vision or action, will fool neither farmers nor the poor of this country.‪#‎Budget2016‬ lacks both vision & conviction.A list of new promises without any account of the failure of tall promises made in last 2 budgets! Finance Minister Arun Jaitley listed ‘nine pillars’ including tax reforms, promoting ease of doing business and ensuring fiscal discipline, that will transform India. 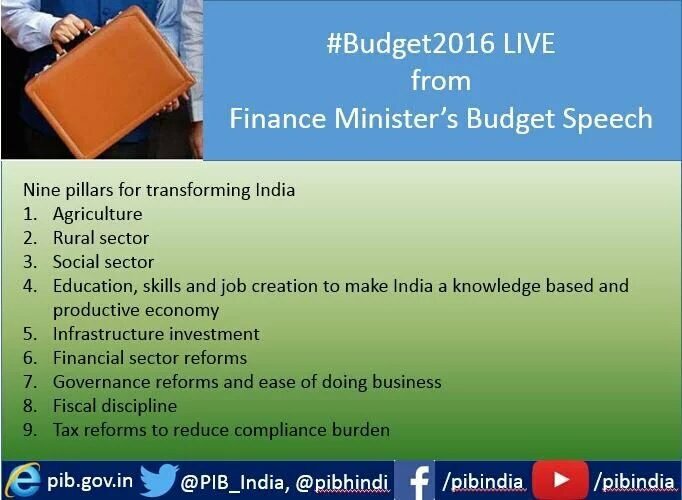 Unveiling the Budget 2016-17, he said the pillars also include emphasis on governance reforms. The other pillars, he added, include focus on agriculture and rural areas with a view to doubling farm income by 2022. Besides, he said, government will lay greater emphasis on social sectors, education and skill building and job creation for building a knowledge based and productive economy. The government, Jaitley said, will also focus on infrastructure investment, financial sector reforms, fiscal discipline and tax reforms to reduce compliance burden. Key announcements in his budget speech includes opening up of 62 new navodaya vidyalayas. The Govt is focusing on the agriculture sector with many implements cheaper for the farmers. Prices for Fertilisers for farmers have been lowered. Electric motor pump, cold storage and refrigerated containers have been made cheaper for farmers so that they can send their products to the common man with ease. A huge rebate for flats in the size of 30 upto 30 sq metres under Sabke Liye Awaas Scheme while contruction materials in home building would be cheaper. Also, dialysis and artificial body parts, things used by Divyangs would be cheaper. Government has given rebate in prices of sanitary pads, napkins, leading to their cheaper price. While people will get rebate in some insurance policies related to NPS. Reading-writing related paper, paperboard and newsprint would become cheaper. Computer parts, microwave, set-top box, broadband router, electric items, CCTV, mobile battery solar lamp, wing energy equipments would be cheaper. Talking about the other aspect of the Budget, Luxury and comfortable items would be dearer. One has to shell more for buying Car, Luxury car, SUV. Pan and Tobacco products like cigarette, Bidi, Pan Masala and Gutkha would be costlier. Kaju, Packaged beverage, mineral water would also cost more. Mobile phones, branded readymade clothes worth over one thousand rupees and footwear would now cost more. Rubber products would cost more. Travel by ropeway, cable-car, aerial tram would be costlier. Artificial jewellery, aluminium products, industrial solar water heater, solar tempered glass to be costlier. Drawing and design making for any plan would be costlier. Charger, battery, adaptor, telecom equipments, optical fibre, laptop and desktop computer, tablet, mobile phone prices to go up. Imported defence equipments and road construction equipment to be costlier. Finance Minister Arun Jaitley spelt out the Agenda for transformative measures for India that will be undertaken based on 9 pillars. Finance Minister said that Forex Reserves have reached their highest mark at $350 billion. Arun Jaitley spelt out schemes envisaged for the welfare of farmers, women and weaker sections of society. A dedicated irrigation fund worth Rs 20,000 crore to be set up under NABARD. Arun Jaitley announced three specific initiatives for effective procurement to ensure MSP reaches farmers all across the country. By: Sudhin Mathur, Director- Smartphone Business, Lenovo Mobile Business Group (MBG) based on the Union Budget for 2016-17. For the healthcare sector,the three major measures announced are aimed largely at the underserved and rural segments of the country, and support the National Health Policy 2015 which advocates healthcare as a fundamental right. The announcement of Health Protection Schemewhich will offer health insurance of upto INR 1 lakh per family and INR 1.3 lakh for senior citizens,is welcome as this will be in addition to the Rashtriya Swasthya Bima Yojana which currently provides a cover of INR 30,000. This, we believe is a significant move towards universal health cover. A recent research published in Lancet suggests that up to 70% patients in India who start dialysis discontinue it within three months of starting it due to the high cost. In this light, the announcement of a National Dialysis Service Programme to provide treatment at all district hospitals through Public Private Partnership will not only make it more accessible but will also reduce the cost of procedure. We hope this will address the issue of discontinuation of the treatment and reduce the mortalitycaused due to complications arising from incomplete treatment. Rajeev Dimri, Leader, Indirect Tax, BMR & Associates LLP. He specializes in structuring domestic & cross-border transactions for goods and services covering a range of indirect tax issues. He is reachable @ +919811060585 or you can mail him at Rajeev.Dimri@bmradvisors.com. Budget announcements seem well directed with focus on rural economy, infrastructure spending, social welfare schemes and ‘digital’ initiatives. Rationalization of indirect tax and duty structures for various sectors such as IT hardware, defence, mineral and petrochemical, aviation to name a few, with a view to encouraging Make in India initiative is a welcome move. Overall, coverage of various sectors of the economy was comprehensive with focus on keeping the Government spending within acceptable limits of fiscal prudence. On the taxation front, the focus on dispute resolution through creation of new tribunal benches, alternative settlement schemes and commitment to refrain from retrospective taxation going forward was encouraging and progressive. However, their efficacy would need to be evaluated based on the fine print of the associated regulations. While no firm commitment on Goods and Services Tax (GST) timelines was made, the industry expectation was to align existing central indirect tax regime with the proposed GST framework. Withdrawal of miscellaneous cesses and rationalization of CENVAT credit mechanism appear to be small steps in this direction. However, introduction of new cesses in addition to those introduced in the previous year, run contrary to that expectation and appears regressive. On the whole, there is an estimated net increase in tax revenue by almost Rs. 20,000 crores. The sectors contributing to the incremental taxes and resultant impact on the economy as a whole will be keenly watched. Naresh Kumar Sagar shared Arun Jaitley‘s album. Indian finance minister will present it union budget but will this budget need to make its mark on public spending and policy towards common man friendly and help catalyst the global surge to domestic surge so the expectation are of the staggering order. When the government in itself lacks specialist and experts in its kitty.The budget though purely of conflicting theoretical consumption and personalize will not be able to submit transparency and accountability or the allocation to the priority thus find the national fiscal exercise fall flat. But it is to be useful for dispersal its treasury fund in federal structure for their yearly expenses,salaries of eight million government job workers . RURAL economy in shambles, farmers in pathetic condition, agrarians with one tier insufficient income puts nation in shame. Every fourth men out of ten men in the country are dependent on agriculture skill knowledge up gradation and one moves with rural direction, the skill development lies in talk bathe with no institution and efforts in this direction. People those loaded with skill lack opportunity of employment find diffucult to get in the opportunity to get into system. Those few get chance in system gets to cosy comfort, the rest are bursting in poverty. FMArun raises to speak on Budget but opposition raise on Smirti issu . Amid slogan FM starts Initiates on global crisis in which India bright spots blames congress and assures the govt is on firm footing observing GDP at higher rate. Finance Minister Shri Arun Jaitley presented his third Annual Budget 2016-17. With an eye on supporting the small tax-payer and the small investor, the Hon’ble Minister announced a number of schemes and small income tax exemptions. With a total plan outlay of Rs. 706248 crores, this year’s budget Fiscal deficit is targeted at 3.5% of GDP. Total proposed outlay on infrastructure in 2016-17 is Rs. 2,21,246 crore which will boost domestic demand.Presenting his third successive Budget in the Lok Sabha today, Finance Minister Arun Jaitley listed nine thrust areas of tax proposals to transform India. Relief to small tax payers, measures to boost growth and employment, incentives to domestic value addition for Make in India, moving towards a pensioned society, affordable housing, resource mobilisation for agriculture, rural economy and clean environment, reducing of litigation in taxation, its simplification and use of technology for creating accountability will be his focus. To provide relief to small tax payers, he proposed to raise the ceiling of tax rebate under section 87A from Rs 2,000 to 5,000 for income not exceeding Rs 5 lakh. Two crore tax payers will get a relief of Rs 3,000. Additional deduction of Rs 36,000 a year is proposed for those who do not own any house or get any house rent allowance. They will get an exemption upto Rs 60,000 now. Presumptive taxation extended to professionals with gross receipts upto Rs 50 lakh.To boost growth, Mr. Jaitley came out with a road map on corporate tax and exemptions. The accelerated depreciation will be limited to a maximum of 40 per cent from 1.4.2017 and the deductions for research would be limited 150 per cent from 2017 to 100 per cent from 2020. The new manufacturing companies coming up after March this year, will be given an option to be taxed at 25 per cent plus surcharge and cess. But they should not claim profit linked or investment linked deductions. He also proposed to lower the corporate income tax rate for the next financial year for small enterprises with a turnover of not exceeding five crore rupees to 29 per cent. Startups for Make in India will get 100 per cent deduction of profits for three out of five years from the coming financial year to 2019. The Budget also focused on moving towards a pensioned society. Withdrawal up to 40 per cent of the corpus at the time of retirement will be exempted in National Pension Scheme. The first home buyers are proposed to get a deduction of additional interest of Rs 50,000 for loans up to Rs 35 lakh. 100 per cent deduction for profits for undertakings taking up housing projects for flats upto 30 square metres in four metros and 60 square metres in other cities. The Budget also proposes changes in reforms in FDI and related policies. Foreign investment will be allowed in the insurance and pension sectors in the automatic route upto 49%. 100% FDI in asset reconstruction companies will also be permitted. Investment limit for foreign entities in Indian stock exchanges has been increased to 15% from 5 % to boost global competitiveness of Indian stock exchanges. Foreign investors will be given residency status in place of the five year business visa to promote Make-in-India. LIC will set up a dedicated fund to boost credit for infrastructure projects. Allocations for agriculture and farmers welfare has been doubled to Rs 44,000 crore and interest subvention to farmers will continue. Half per cent Krishi Kalyan Cess is proposed to be levied on all taxable services to improve agriculture. 89 irrigation projects will be fast tracked. To boost Make in India initiatives, the budget proposes changes in customs and excise duty rates on certain inputs, raw materials, intermediaries and components. Excise duty on electric motor, shafts and sleeve has been reduced six per cent from 12.5 per cent and basic customs duty for cold storage, cold room has been slashed by half to five per cent. Excise duty on refrigerated containers have also been reduced to 6 % from 12.5%. Excise duty has been removed on physical mixture of fertilisers, made out of chemical fertilisers for cooperative societies. Industrial solar water heaters are to cost more with customs duty hiked to 10% from 5 %. Electronic items, electric motors, electrical equipment, paper, paper board, newsprint and fiber and yarns are to cost less to give incentives for domestic value addition for Make in India. Imitation jewellery and balloons are to cost more. Overhauling of aircraft and ship will be cheaper so also aluminium and iron. To broaden the service tax, the exemption given to senior advocates or partnership firm of advocates providing legal services is proposed to be withdrawn. Exemption given to construction work for monorail or metro for contracts entered after 1st next month has been withdrawn. Exemption to the services of transport of passengers by ropeway, cable car or aerial tramway are also withdrawn. To promote construction sector and affordable housing, service tax is exempted under housing for all mission and Pradhan Mantri Awas Yojana. Low cost houses upto 60 square metres per house in a project by state government will also be exempted from service tax. Service tax on life insurance business provided by way of annuity under national pension scheme and on services by employees provident fund are proposed to be withdrawn. Electric and hybrid vehicles to continue to get tax benefits but Golf cars will cost more with customs duty hiked to 60% from 10%. To boost use of renewable energy, excise duty proposed to be reduced on the inputs for the manufacture of rotor blades and other parts. Excise duty exemption on articles of jewellery is being withdrawn with the higher threshold exemption upto Rs 6 crore in a year. Footwear to cost less with excise duty cut to six per cent from 12.5 per cent on rubber sheets and resin rubber sheets for soles and heels. To make doing business easy and to simplify taxation, 13 cesses levied by various Ministries are being abolished. Clean environment cess on coal and lignite has been increased to Rs 400 per metric tonne from Rs 200 . To reduce litigation and providing certainty in taxation, the budget proposes to move towards a lower tax regime with no litigation approach. To tackle undisclosed income, the budget proposed payment of tax at 30%, surcharge 7.5 % and penalty at 7.5% amounting to a total of 45% . The scheme has a limited period of compliance from 1st of June to 30th of September this year. The undisclosed amount should be paid with tax within two months of declaration. It also proposes a new dispute resolution scheme to cut down the three lakh cases pending for disposal. A tax payer who has appeal pending can settle his case by paying the disputed tax and interest upto the date of assessment. No penalty in respect of income tax cases with disputed tax upto Rs 10 lakh will be levied. Mr. Jaitley reiterated the assurance given by him that the Government will not retrospectively create a fresh tax liability. The penalty rate for concealment of income is proposed to be reduced to 50 per cent of tax in the case of under reporting and 200 per cent of tax for misreporting of facts. This will replace the Income Tax Officer’s discretion of levying in penalty at the rate of 100 to 300%. Government will reorient its intervention in the farm and non-farm sectors to shift focus beyond the country’s food security to farmers’ income security. He said that a total allocation of about Rs 40000 crore is proposed to double the income of farmers by 2022. He said that a Unified Agricultural Marketing E-Platform will be dedicated to the nation on the Birthday of Dr.Baba Saheb Ambedkar on 14th April this year to help farmers in accessing markets which is critical for enhancing their income. The Finance Minister said that Pradhan Mantri Krishi Sichai Yojna will be implemented in Mission Mode in order to bring 28.5 lakh hectares under the scheme. He said that a long term Irrigation Fund will be created in NABARD with an initial Corpus of about Rs 20,000 crore. Mr. Jaitley said that allocation of Rs 19,000 crore is proposed during 2016-17 for implementation of Pradhan Mantri Gram Sadak Yojna. He said that the pace of construction of roads per day under the scheme will be substantially stepped up. The budget put special focus on adequate and timely flow of credit to the farmers. All time high of Rs.9 lakh crore is being allocated for agriculture credit. To reduce the burden of loan repayment on farmers, a provision of Rs 15,000 crore has been made towards interest subvention. A provision of Rs 5,500 crore has been made in the budget for Prime Minister Fasal Bima Yojna. Referring to Rural Sector, the Finance Minister said that an overall. 87,700 crores have been allocated for its development. He said, Rs 2.87 lakh crore will be given as grant-in-aid to Gram Panchayat and Municipalities marking a quantum jump of 228 percent compared to the previous five year period. He said that Rs 38,500 crore have been allocated for Mahatma Gandhi National Rural Employment Generation Scheme, MGNREGS. Mr. Jaitley said that Government is committed to achieve 100 percent rural electrification by 1st May 2018. Rs 8,500 crore have been provided for Deen Dayal Upadhyaya Gram Jyoti Yojna and Integrated Power Development Schemes in this regard. 9,000 crore have been provided for Swachh Bharat Mission to improve sanitation and cleanliness especially in rural India. A new Digital Literacy Mission Scheme will be launched to cover around 6 crore additional rural households within next 3 years. Referring to Social Sector, the Finance Minister said that unforeseen catastrophic health events push lakhs of households below the poverty line every year. In order to help such families, Mr. Jaitley said that a Health Insurance Scheme is being launched to protect one third of India’s population against hospitalisation expenditure. He said that the scheme will provide health cover upto Rs 1 lakh per family. The Union Budget envisaged a total outlay of Rs 340,922 crore for Defence ministry. It also includes separate provision of Rs 82333 crore for defence pensions. Defence budget accounts for 17.21 per cent of the total Central Government expenditure and 2.26 per cent of the GDP. Sensex at the Bombay Stock Exchange is trading in red in reaction to the Union Budget presented before Parliament today. The 30- share index has recovered after briefly plunging 660 points and was trading 56 points at 23,098 a short while ago. The broader Nifty also followed the similar trend and is about 30 points down hovering just above 7000 mark. And at the forex market, the rupee had appreciated 15 paise, to 68.47 against the dollar in afternoon deals. CII today hailed the General Budget as well balanced and progressive. Briefing media in New Delhi, CII President Sumit Mazumdar said a lot of announcements were made in rural economy and infrastructure sectors. He said there were some concerns on bad loans, and the Finance Minister has provided some relief in the area. Mr Mazumdar said required emphasis of rural sectors is present in the Budget. He said some taxes have gone up which is fair and acceptable.Federation of Indian Chamber of Commerce and Industries, FICCI has welcomed the budget saying that it is balanced, progressive and focused. Speaking to AIR, FICCI President Harshvardhan Neotia said, the announcement on Agriculture, Rural development and Infrastructure will give further boost to economy and generate employment.